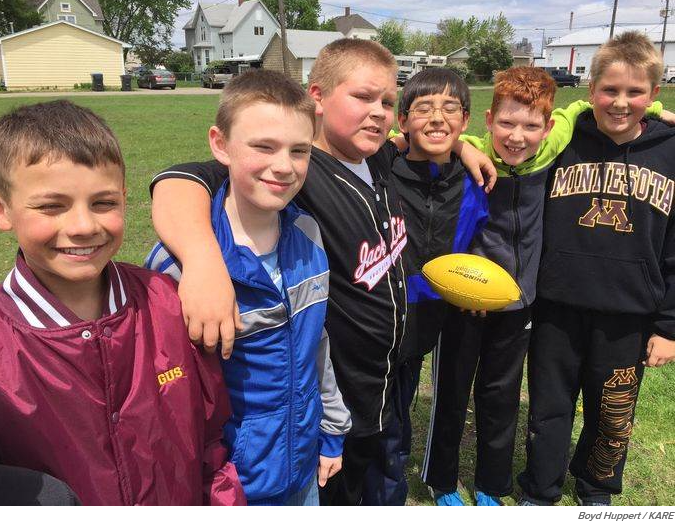 At the end of this year, Mankato Area Public Schools honored five fifth-grade boys from Franklin Elementary in Mankato, Minnesota with its Spirit of Youth Award. Their teacher, Mallory Howk, had nominated them after witnessing their interactions with James Willmert, a boy at the school with a learning disability who’d been adopted from an orphanage in Colombia, and whose new father had been killed in a bicycle accident. Jake had first witnessed James getting bullied one day at recess. He and his four friends — Jack Pemble, Gus Gartzke, Tyler Jones, and Landon Kopischke — explained that what they saw wasn’t explicitly violent or physical. But it still upset them. “They were, like, using him and taking advantage of him,” Jake explained to KARE. “He’s easier to pick on and it’s just not right,” Jack added. The five of them knew that they couldn’t stand for something like that to happen to James again. And they realized that the best way to protect him and stand up to the bullies was quite easy: They would be his friend. Easy, maybe, but certainly not the normal course of action for a group of socially-conscious fifth graders. 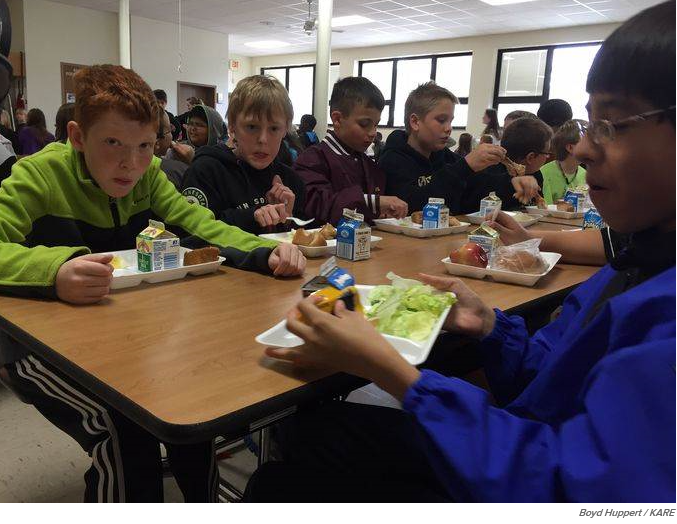 They began inviting James to eat at their table during lunch, which he now does regularly. Often, he’ll need assistance opening bags of chips or small boxes of raisins. He simply holds up the package, and, without so much as pausing their conversation, his new friends patiently break the seal for him. And whenever he needs someone to tie his shoes, another frequent occurrence, one of the friends will quickly bend down to do it for him. “It really kind of makes you proud to be their teacher,” said Howk, who believes that the school’s anti-bullying programs have had some effect on the kids, but that their kindness must also come from sheer instinct. James and his family have also been moved by the boys’ kindness. His mother has been particularly grateful. “He used to not want to go out for recess or anything, it would be like a struggle. And now he can barely eat his lunch to get outside to play with those guys,” said Margi Willmert. That’s probably because when everyone gathers outside to play touch football at recess, Gus, Tyler, Landon, Jake and Jack always make sure that James gets to make a touchdown — sometimes, more than one. But this isn’t just about being kind for the sake of being kind. The five friends have learned that there’s a lot to love about James. And while the whole thing’s mostly been a lesson in empathy, it’s also led to the development of a genuine friendship. “He has a notebook with over 600 teams of college,” Tyler told KARE when asked about his new friend. “That’s how much he likes sports,” interrupted Jack, equally impressed. The boys pooled together their own money and a collective donation from their parents and recently delivered video games and a PlayStation to James’ house. Video games alone are pretty exciting. But the occasion also marked the first time anyone from school had come over to play. “I’ll never forget it. Never,” Margi said. Such an uplifting story i wish we had kids like this in my son’s school. thanks for sharing. We also had our son trained in karate for self-confidence and to be used only defensively. Fortunately. he never had to use it. I am glad you did the same for your son, and that he grew into it on all levels. You should be proud of him! Now I begin to understand the reason I am being bullied. It is upsetting for my parents didn’t say I am an autistic.